Ideal body for the summer – how to get it? Today is the first day of the Spring! There are first crocuses on the grass, catkins grow on the trees, and birds come from warm countries. The sun is shining and thanks to vitamin D our mood is better than in winter’s dark days. March is the time of great clean-up both at home and in the wardrobe. Ladies bring out mops and clean up every corner of their home. The windows must shine, the floors have to be polished, carpets have to be beaten out and the first pansies should be planted on the balcony or in the garden. The thick coats, dark sweaters and warm boots disappear from the wardrobes, and their place is filled with colorful dresses, pastel trench coats and stylish ballet shoes. Have you trained bravely in the gym all winter? Did you burn kilos on ABT, stretch your body in a crowded yoga room, run bravely on the treadmill to put on a bikini in the summer? Now you do not have to spend your workouts in a crowded gym, the first rays of the sun bring the springtime physical activity to the open air. Do you remember when you did outdoor sports for the last time? Move your yoga mat to the green grass, get off the treadmill and go running in the park. You would like to go for a bike, so leave stationary one and take a biking trip out of the town. It is time to take care of a slim body outdoor. Spring is the perfect time of the year to move your activity to fresh air. Do you know how nice it would be to run in the morning, looking at blooming daffodils and crocuses? Always drink 1 to 2 glasses of water before a meal. Drinking water before a meal helps to lose weight because the water fills the stomach and we feel full faster, so we eat less from the plate. 2. Eat less calories than you burn. To lose weight fast, you need to eat less calories than you are currently burning. Kilogram of fat is 7000 kcal, so to lose one kilogram in 2 weeks, you have to eat 500 calories less than you burn a day. Do you know that we burn calories while working on the computer or watching TV? Fiber is a very good weight loss ingredient. Eat whole wheat bread, raw or slightly cooked vegetables, fruit, whole grains, beans, etc. 4. Stop eating products with high sugar content. End with sweets! Eliminating sugar from your diet will help you to lose a few kilograms. 5. Limit the amount of carbohydrates you eat. Carbohydrates turn into sugar in our body (as well as increase insulin levels). Nowadays, there are many alternative diets without carbs that are both tasty and nutritious. 6. Pay attention to the food portion. Start eating on small plates. Optically the portion will look the same – a plate full of food, but it will be a smaller plate so less calories. We think that diet and exercise will make our body worth the cover of “Women’s health”, but unfortunately, it will not. Sometimes we have to help our figure. How to do it? Make an appointment with VelaShape III treatment! You probably wonder what it is. VelaShape III is the world’s first device for shaping the figure and cellulite reduction using up to 150W of power, which allows heating up adipose tissue to a temperature that permanently destroys it. Because of high temperatures, collagen renewal occurs. Hypotension and mechanical massage increase the elasticity and firmness of the skin. 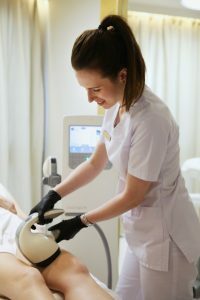 The innovation introduced into VelaShape III is the ability to constantly monitor the temperature of the adipose tissue during the treatment, which greatly enhances its effectiveness and safety over other slimming treatments available on the cosmetic market. This treatment will help shaping the figure, firming it up, removing unnecessary cellulite and that all without using a scalpel. It seems to be impossible, but the results are confirmed after the first visit. However, the best results can be achieved in several series (usually 6) while observing a low fat diet. We must remember that VelaShape is designed to help you get a beautiful figure, but without proper diet and regular exercises, you will not get the perfect result. How is the treatment going? This is a massage with the head (and, more specifically, putting it to the skin at regular intervals) on a gel-moistened skin, giving a feeling of warmth. It is repeated several times, and every time temperature is higher until it reaches 45 degrees. Heat is supposed to stimulate the production of collagen, which will result in firming the selected body part. After the treatment, bruises may appear. However, not to all of women. Diet, exercise and Vela Shape III are three factors that can bring you closer to the desired figure. Thanks to them you will get a dream figure like a Hollywood star, because I do not know whether you know but the Vela Shape treatment loved stars such as Jennifer Aniston, Demi Moore, Madonna or Kim Kardashian. In the springtime, it will be easier for you to take care of your figure. Physical activity, healthy fruits and vegetables will improve your well-being and appearance. Take care of your body in Dr Legrand clinic. You can come to us by bike as our clinic is located on the Vistula boulevards, so after your visit you will be able to spend an active day in the open air.